If you can zoom (not sure if that’s possible), you’ll notice the theme is golf. Of course, I didn’t save my selvedges, so I have no clue about the name or manufacturer of the fabric. I love the cartoon golfer and his exploits…it reminds me of my dad and another favorite movie of mine, Caddyshack. Caddyshack was the first videotape we owned back in 1985, when VCR’s cost thousands and the videotape choices were either Betamax or VHS. It was the only tape we had for ages and I watched it hundreds, nay, thousands of times. Fortunately, my naive nine-year old noggin couldn’t comprehend most of the innuendos or adult themes. Lacey Underall? Spalding? Kentucky Bluegrass crossed with California Sensemillia? Huh? Only now as an adult do I appreciate it fully. How can you go wrong with a Kenny Loggins soundtrack (I’m alright, nobody worry ’bout me! ); a dancing gopher; and a stellar cast featuring Chevy Chase, Ted Knight, Rodney Dangerfield and Bill Murray? Icing on the cake…the movie is full of memorable quotes. Father’s Day Gift Ideas? Yeah, I’ll make it easy…Caddyshack and a Golf Quilt. 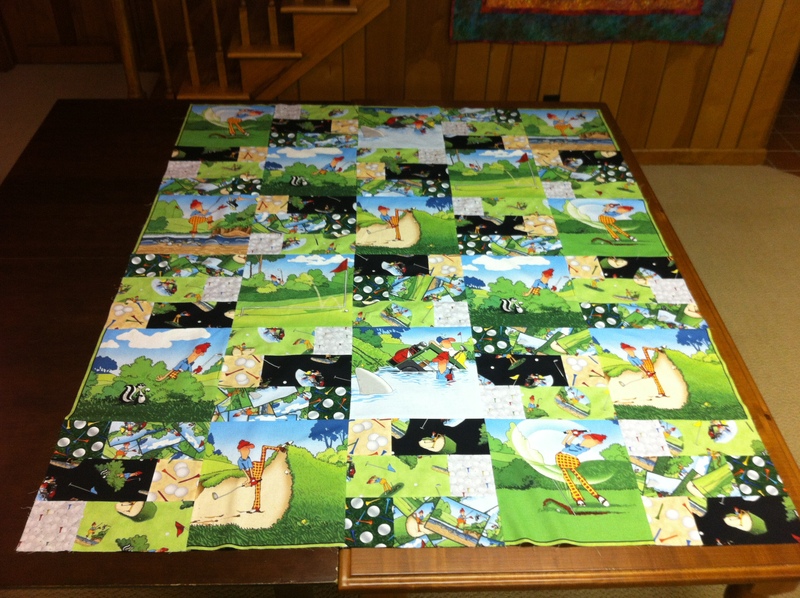 This entry was posted in Boys quilt, Gift ideas, Original Pattern, Quilt, Quilt blocks, Quilting and tagged Caddyshack, Father's Day, Golf, Golf Quilt, Golfer, original pattern, quilt, Sandbagged fabric. Bookmark the permalink. 2 Responses to It’s In The Hole! Very cute. I love that it is a surprise. I love doing quilts that I know someone will really love because it is personal. And such fun fabric. Thank you! I can’t wait to see the finished quilt. (my favorite part is making the quilt top…I have tried free motion quilting and it’s not my cup of tea) I’ll post pictures when it’s completed. I love the photos on your blog! You make a lot of great quilts! Go for the fuchsia! I put funky colors in my hair every year before our family beach trip.